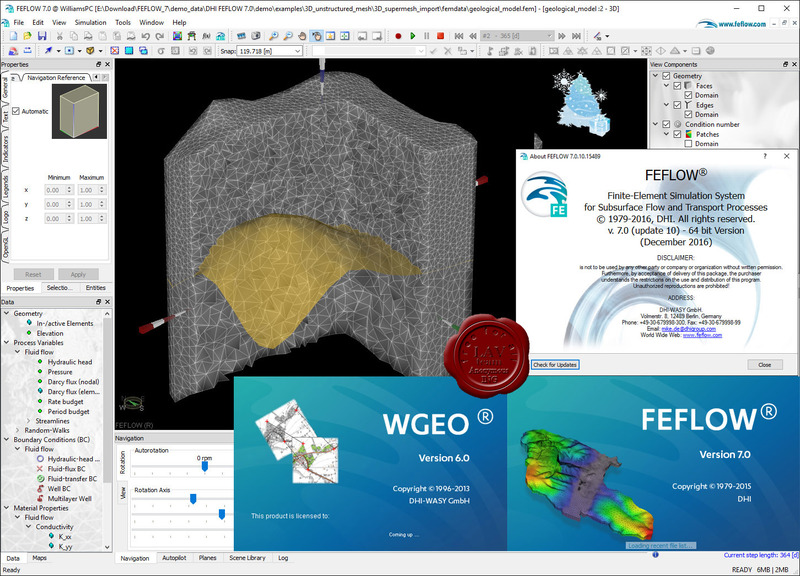 WGEO v6 distributive is stable already for 3 years and includes in every FEFLOW build. This is improved patch only. Studies for environmental impact assessments. For decades MIKE by DHI has set standards for what is possible in water modelling – and now we are doing it again! Release 2014 is here and its numerous new features provide many new possibilities that will facilitate your work even more. The demands for highly advanced and innovative modelling tools are continuously increasing and DHI strives to be on the forefront of these future demands and deliver products and services that match your specific modelling needs. Now, with Release 2014, software modelling has become even more efficient including improved usability and flexibility. With the improvements of Release 2014 it is once again emphasised why MIKE by DHI is the ideal and preferred software package for your business within water environments. MIKE by DHI covers the entire water environments cycle in a highly integrated manner and with more features than ever before. Whether you are working within marine, ports and coasts, water resource management, rivers, flooding, urban, groundwater or wastewater, MIKE by DHI 2014 is tailored for your modelling needs. With a new release approximately every year, our software is exposed to real-world testing and continuous quality enhancements by experts. GIS-based model building and management. Integrated water quality, fire flow, real time control and water hammer simulation (water distribution).- Integrated water quality, sediment transport, real-time control, dynamic pipe design and long-term statistics (collection systems). Full undo and redo capability in all editors. Thematic mapping and integrated dynamic result visualisation. Open data models - easy integration with other applications. - MIKE HYDRO - A physical and conceptual model system for catchments, rivers and floodplains. - MIKE 11 - a 1D modelling system for rivers and channels. - MIKE 21 - a 2D modelling system for estuaries, coastal water and seas. - MIKE 3 - a 3D modelling system for deep seas, estuaries and coastal waters. - MIKE 21/3 - Integrated Models (including the MIKE 21/3 Coupled Model FM, which allows full dynamic coupling between wave, flow and sediment transport models). - MIKE FLOOD - a 1D-2D modelling system for inland flood and urban flood studies. - LITPACK - a modelling system for littoral processes and coastline kinetics. - MIKE SHE - a modelling system for coupled groundwater and surface water resources. For decades MIKE by DHI has set standards for what is possible in water modelling – and now we are doing it again! Release 2012 is here and its numerous new features provide many new possibilities that will facilitate your work even more. The demands for highly advanced and innovative modelling tools are continuously increasing and DHI strives to be on the forefront of these future demands and deliver products and services that match your specific modelling needs. 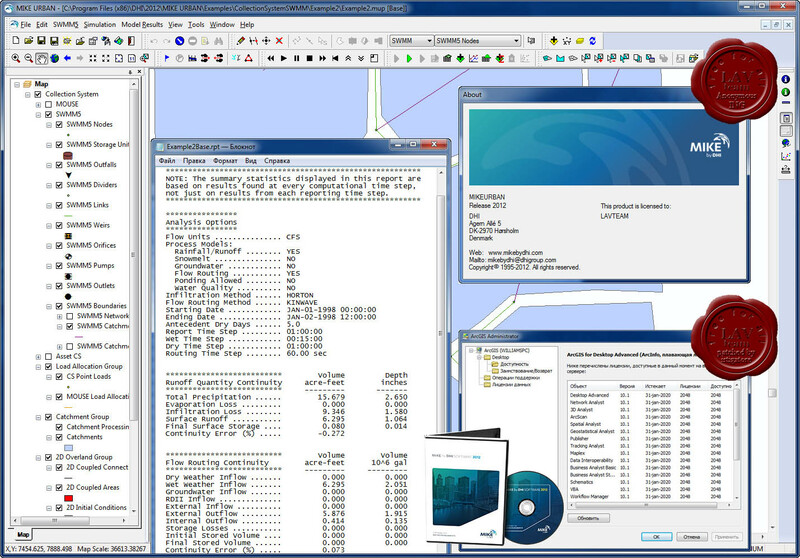 Now, with Release 2012, software modelling has become even more efficient including improved usability and flexibility. 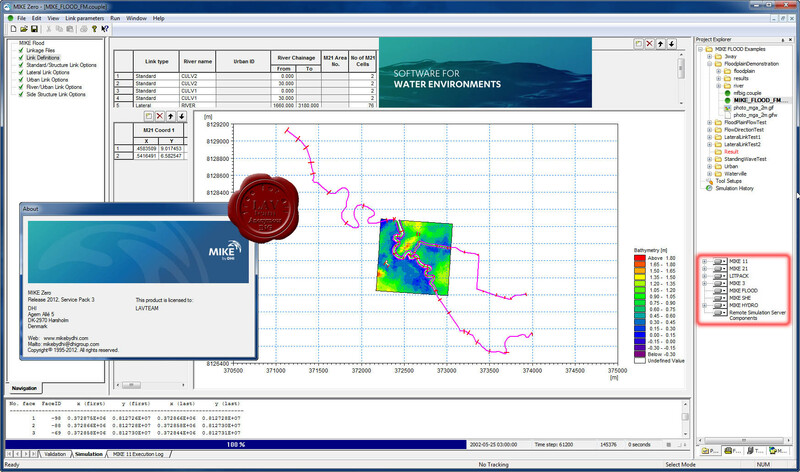 With the improvements of Release 2012 it is once again emphasised why MIKE by DHI is the ideal and preferred software package for your business within water environments. MIKE by DHI covers the entire water environments cycle in a highly integrated manner and with more features than ever before. 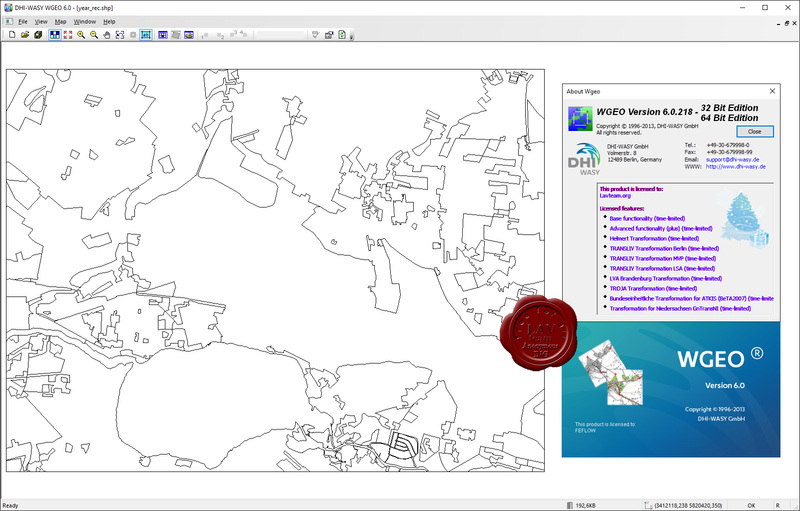 Whether you are working within marine, ports and coasts, water resource management, rivers, flooding, urban, groundwater or wastewater, MIKE by DHI 2012 is tailored for your modelling needs. With a new release approximately every year, our software is exposed to real-world testing and continuous quality enhancements by experts. MIKE GIS is a pre- and post-processing module for MIKE 11. 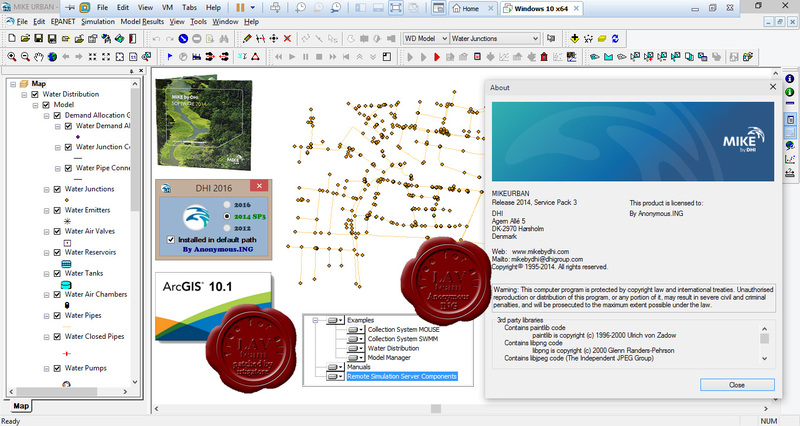 As an extension to ESRI ArcMAP v10.1 version and requires that ArcGIS is pre-installed. It assist setting up network, cross sectional and boundary files for MIKE 11 models, and can be used to present time series results and flood maps from MIKE 11 simulations. 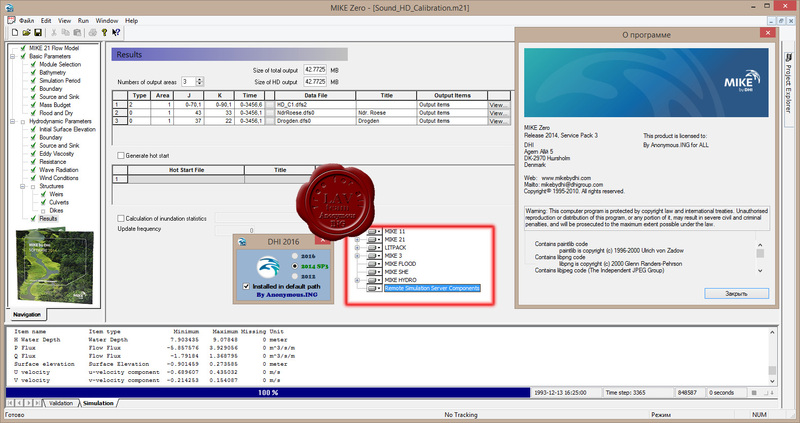 It also includes non point and point pollutant load estimation tools for MIKE 11 WQ simulations. A comprehensive time series data management capability is included. MIKE HYDRO - A physical and conceptual model system for catchments, rivers and floodplains. 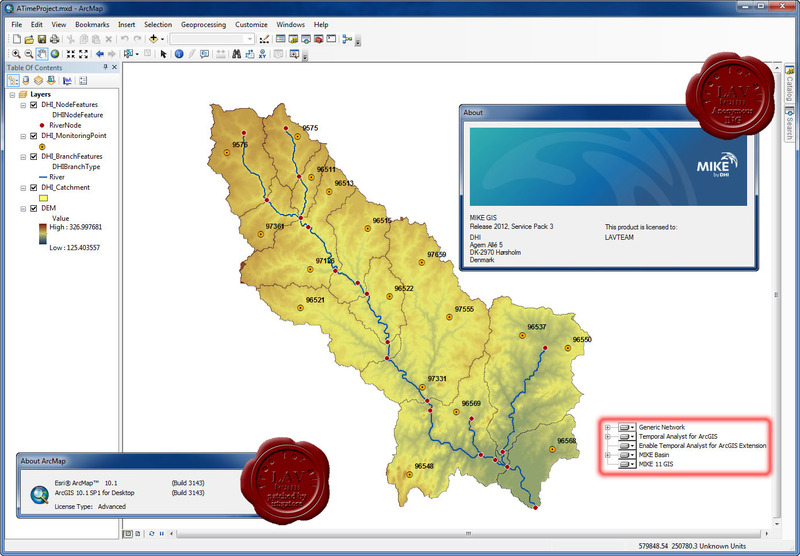 MIKE 11 - a 1D modelling system for rivers and channels. MIKE 21 - a 2D modelling system for estuaries, coastal water and seas. MIKE 3 - a 3D modelling system for deep seas, estuaries and coastal waters. MIKE 21/3 - Integrated Models (including the MIKE 21/3 Coupled Model FM, which allows full dynamic coupling between wave, flow and sediment transport models). MIKE FLOOD - a 1D-2D modelling system for inland flood and urban flood studies. LITPACK - a modelling system for littoral processes and coastline kinetics. MIKE SHE - a modelling system for coupled groundwater and surface water resources. Integrated water quality, fire flow, real time control and water hammer simulation (water distribution). Integrated water quality, sediment transport, real-time control, dynamic pipe design and long-term statistics (collection systems).